We want to be able to change the background color of the thumb control to match the slider value. In order to do this, we first need to create the base CSS classes to style the control. We are also creating some thumb classes with the corresponding background color. Now that we have styled our control, we want to map the selected slider value to a CSS class that we defined. We can do this by using the range control oninput event which fires when the value changes. In the code, we define a hash table with the possible slider values as keys. This enables us to quickly resolve the class name for the current value. When the value changes, we set the range controller class name to the slider base class plus the thumb class which provides the button background color. With this article, we are able to show how easy it is to style the range input control to make it provide better visual feedback to the end users. A common task for document management system is to move a document from one library to another based on a particular condition or content type. 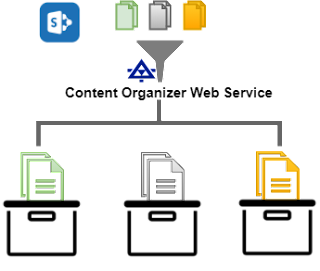 To enable this feature, SharePoint provides some core actions that can let you copy the document to another site collection and then delete it from the source. In our case, we want to be able to move the document using a more complex action called Send Document to Repository which moves a document by using the Content Organizer Web Service. Note: Content type enables us to organize documents and associate them to content rules which can enable us to route documents to specific document libraries. This core action enables us to move a document to another library within the same site collection using a SharePoint web service named Official File. In order to enable this web service endpoint, we need to enable a site feature and configure some content rules. Create metadata based rules that move content submitted to this site to the correct library or folder. Note: We use this address when we add the workflow action. We want a rule for the Document content type, and we want to send the document to the ArchiveLibray. As we can see, here we could route documents based on custom content types to other libraries. 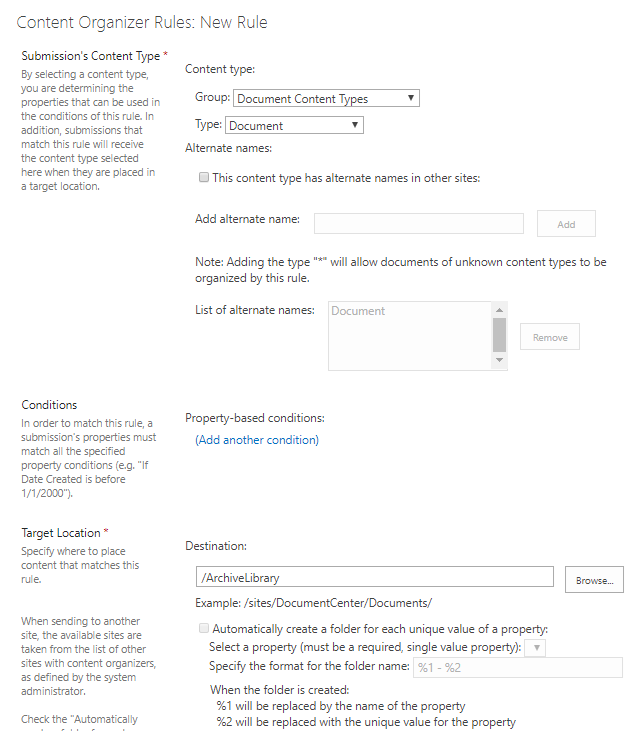 Note: When using custom content types, we can have a more granular set of rules to send documents to other libraries that are based on that content type. We have now setup all the requirements to be able to send or move our document to another location. We can now add a workflow using SharePoint Designer. On our first step, we want to add the Send Document to Repository action. Note: SharePoint 2010 Workflows provide this action. This allows us to indicate to copy or move the document. This is needed to indicate where the web service is located. Use the address that was identified on the previous sections. Use this parameter to add some comment about the action. In our example, we are deciding to move the document using our previously defined Content Organizer Web Service. In this example, there are no specific conditions to validate for this action, but this is the area we can validate a document status and run the action accordingly. We have shown how to use the Content Organizer Web Service and a workflow action. With this approach there are more configuration steps that need to be complete in order to support the solution. The additional configuration does bring added value as it can enable us to route documents based on their content type to other document libraries. For cases where a simpler approach is desirable, we can refer to the article below which essentially shows us how to use the Copy and Delete core actions to implement a simpler Move action. 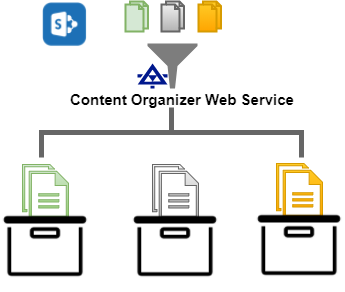 I hope this is able to show you a way to move document across document locations using a workflow action and the Content Organizer Web Service. A common task for document management system is to move a document from one library to another when the document approval status meets some condition. Unfortunately, there is no Move core action provided from the out of box functionality. There is however other core actions that we can leverage to implement this solution. When building our workflows, we can use a couple of actions that enable us to move a document from one document library to another. After adding a workflow using SharePoint Designer, we can add a couple of actions to the first step. For the copy item action, we want to select the current item which is a reference to the document that triggers the workflow. We also select the document library where we want to copy the document. This action makes a copy of the document, so this means that the document is located in two different document libraries which may not be the intended behavior. After the document is copied, we can delete the document from the current location using the Delete action and passing the current item as an argument. This should remove the other copy from the source document library. In our example, we copy the current item to a Drop Off document library. Since we do not want a copy of the document on the source library, we then delete the current item. Note: Current item is the scope object reference to the document that triggers the workflow. We have shown that a move action can be implemented using the Copy and Delete core actions. For some use cases, this may not be a correct implementation since this creates a copy of the document and a different document id which uniquely identifies a document in the system. I hope this is able to provide you with a simple approach to move a document from one document library to another. 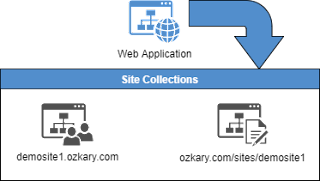 On SharePoint, we usually create site collections using the path-based route. This approach aligns very well with the SharePoint online/Office 365 site structure recommendations. 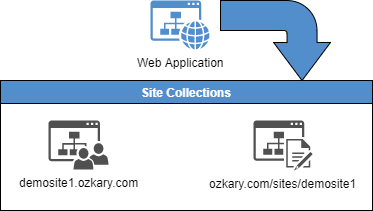 With SharePoint 2013, we can create a site collection using a host-named site which allows us to assign a unique DNS name to our site collections. This enables us to deploy multiple sites with different DNS names in the same web application. In order to deploy a host-named site, we need to create a DNS entry that points to the SharePoint host server/farm. We then need to write some code using PowerShell as this feature is not available from the Admin Central. 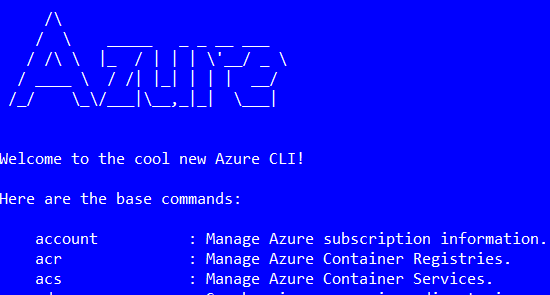 To create the site collection, we run this custom function from PowerShell with elevated permissions. createHostNamedSite "ozkary.com" "https://demosite1.ozkary.com" "Demo Site 1" "Demo Site 1 Description" "admin-account" "STS#0" "WSS_Content_DB"
$continue = Read-Host -Prompt "Do you want to continue (y/n)"
On the code , we first include the SharePoint plug-in which enables us to use the New-SPSite cmdlet that handles all the hard work for us. Another area to notice is that there is the HostHeaderWebApplication parameter for which we pass the SharePoint web application reference by using the Get-SPWebApplication cmdlet. This is what enables us to create the host-named site. After the site is created, we should be able to type the DNS name, and if it is already created and propagated in your network, the request should be able to be sent to SharePoint which can load the corresponding site properly. I hope this is helpful and enjoy your site creation automation (DevOps) with PowerShell.